On December 3, the National Family Partnership (NFP) announced 20 winners of its 8th Annual National Red Ribbon Week Photo Contest. One Florida school, Orlando Science Charter School was named the Region 2 school entry winner for receiving the most votes in the Southeastern United States in support of its photo. To participate in the contest, families and schools across the country decorated either their homes or school campuses with this year’s Red Ribbon theme: “Life is Your Journey. Travel Drug Free.” A total of $20,000 will be awarded to K-12 schools, which includes 10 winners who received the most votes in their region and 10 winners who were selected for Judges Awards. The families and individuals who entered on behalf of the schools will also receive an ipad. ‘Tis the season for giving! 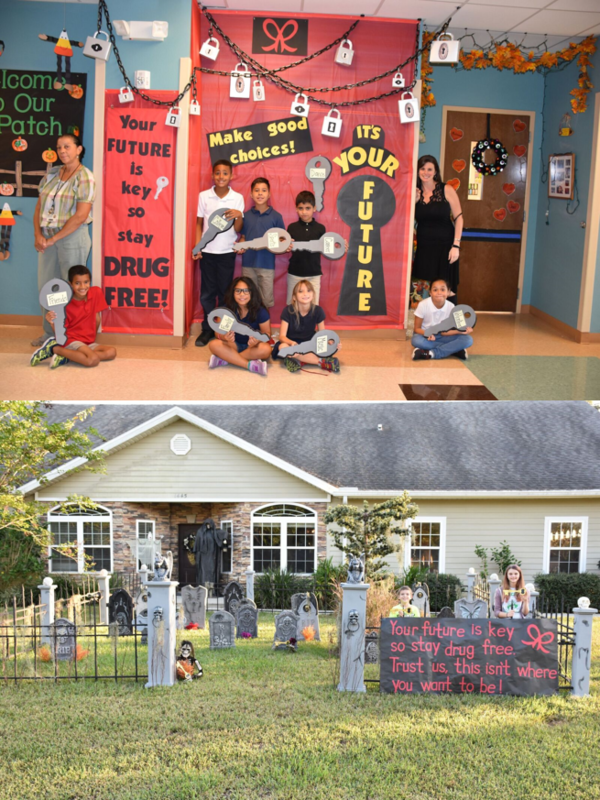 East Lake Elementary School and the Sims family are the proud winners of the much-anticipated 2017 National Red Ribbon Week and Informed Families’ Florida Red Ribbon Week Photo Contests. Students, faculty and staff were fearlessly led by Teacher Jean Jupa in decorating the campus with this year’s theme, “Your Future Is Key, So Stay Drug Free®”. At the same time, the Sims family honored the tradition of the nation’s oldest drug prevention campaign by decorating the front of their home to promote their commitment to living a healthy and drug-free lifestyle during Red Ribbon Week ® (Oct. 23-31). Jean Jupa and the Sims Family will each receive an iPad from NFP, the school will receive $500 from Informed Families for winning the Florida Red Ribbon Photo Contest and a $2,000 prize from National Red Ribbon Photo Contest co-sponsors, the Drug Enforcement Administration (DEA), to be used toward drug prevention. 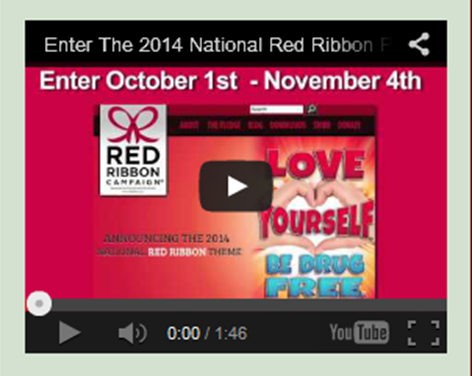 In it's 29th year, National Red Ribbon Week® is alive and thriving. The State of Florida, which has always been a leading state in Red Ribbon Week participation, led by Statewide Sponsor Informed Families, is a wonderful example of the power of grassroots to create lasting change. With the current opioid epidemic, Red Ribbon Week is more important than ever. Families, schools and communities across Florida demonstrated their commitment to a Drug-Free America during 2017 Red Ribbon Week® (October 23-31). Informed Families partnered with volunteer Ambassadors, agencies, organizations and businesses, leveraging resources and reaching more children and families with prevention messages. Red Ribbon Week, the oldest and largest drug prevention program in the nation, was created after the death of DEA Special Agent Enrique “Kiki” Camarena, who was kidnapped, tortured and killed in Mexico in 1985. In 1988, the inaugural National Red Ribbon Week®, sponsored by the National Family Partnership, was created. An estimated 80 million people celebrating each year. Red Ribbon Week is here! Join us in showing support for a drug-free America. Fun Fact: Did you know that the Red Ribbon Campaign is the oldest and largest drug prevention program in the nation? You also may not know that National Red Ribbon Week® (October 23-31) is organized out of Informed Families' offices in Florida. Our President & CEO Peggy Sapp is also the volunteer President of the National Family Partnership, the national sponsor of Red Ribbon Week. 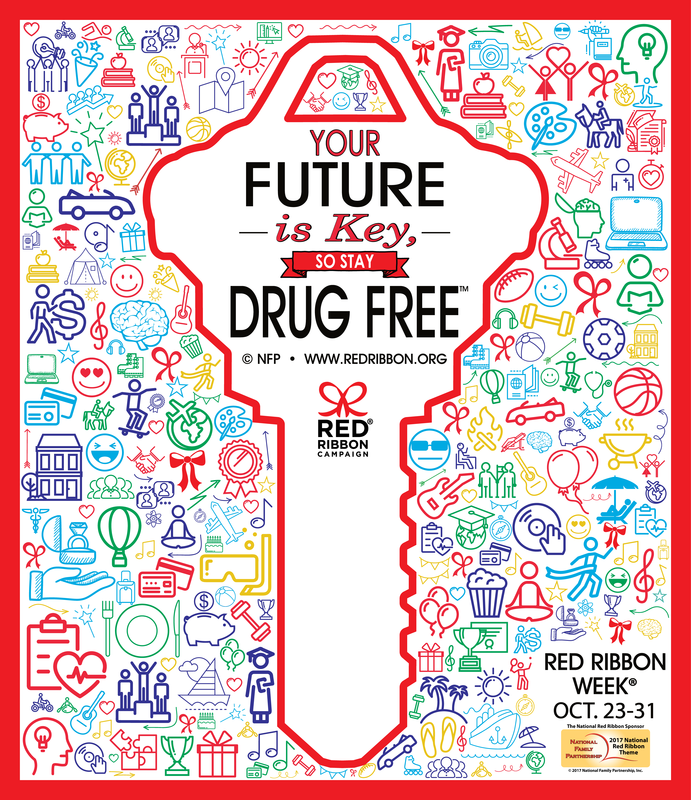 Your Future Is Key, So Stay Drug Free™ is the 2017 National Red Ribbon Week theme and the message being delivered to millions of students and families across America October 23-31. Given the current opioid epidemic facing our country, Red Ribbon Week is more important than ever. It is an opportunity to spread awareness and educate children and families about the consequences of drug use and the importance of a drug free lifestyle. ‘Tis the season for giving! 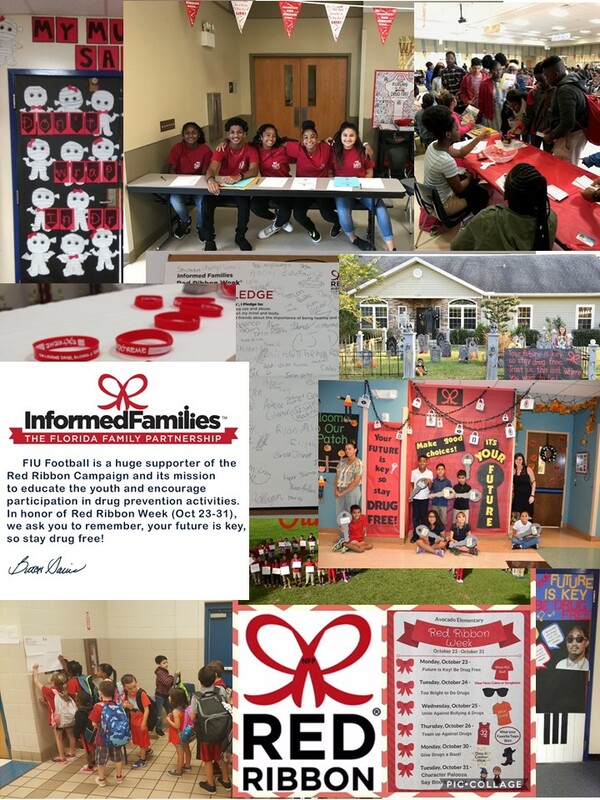 Two Florida schools are the recipient of $1,000 each as part of Informed Families' 2016 Florida Red Ribbon Week Photo Contest. Gabriela Sanchez of Miami won an iPad for her family and $1,000 for Good Shepherd Catholic School. Paola Stauffer, an administrator at Orlando Science Elementary School, won an iPad for herself and $1,000 for her school. 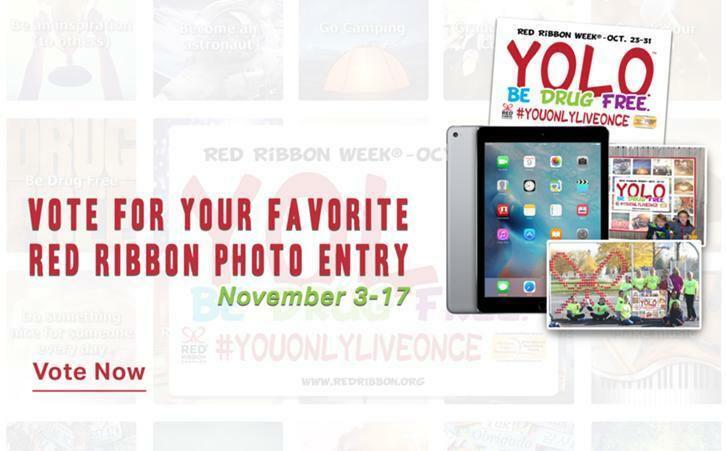 The contest took place as a part of National Red Ribbon Week ® – the nation’s oldest and largest drug prevention campaign, sponsored by the National Family Partnership (NFP). 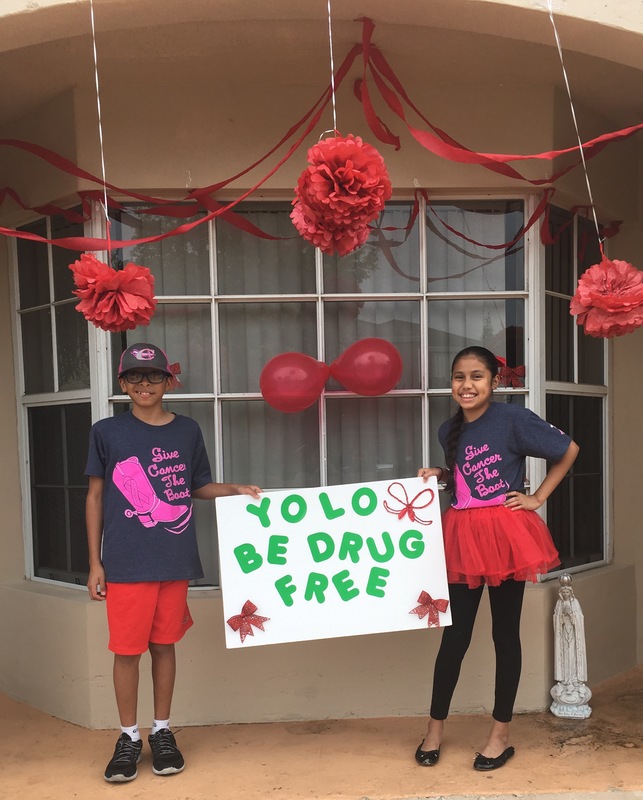 During the month of October, the Sanchez family decorated their home front door and Paola Stauffer worked with her Orlando Science Elementary School community to decorate the school's campus with this year’s Red Ribbon Week theme, “YOLO. Be Drug Free™.” All this was done to promote their commitment to living a healthy and drug-free lifestyle. 43 Florida schools and 19 Florida families need your help to win the 2016 National Red Ribbon Photo Contest. Winners are determined by who has the most votes in each region. Florida entries, which are competing in region 4 of the contest, are just some of the many entries representing multiple states in the southeast vying for the top prize: an ipad and $1,000 for a K-12 school. However, even if the Florida participants don't get the top prize in their region in the National contest, which is co-sponsored by the National Family Partnership and the DEA, Informed Families will be giving out a special prize (an iPad and $1,000 for a K-12 school) to the top school entry and top home entry in Florida with the most votes. The contest asked families to decorate their front door, mailbox or fence and school's to decorate their campus with a double looped red ribbon and this year's theme: "YOLO. Be Drug Free." So what are you waiting for? Vote for your favorite at www.redribbon.org/vote! Voting takes place between now and November 17th. Did You Get The Red Ribbon Message? Did You Pass It On Correctly? During Red Ribbon Week®, the red ribbon is used to symbolize the importance of a healthy, drug free lifestyle. This year’s theme, YOLO. Be Drug Free.® was created by two sixth graders in Claysburg, Pennsylvania. It reminds us to take care of our minds and our bodies. Years ago I directed an after-school program. No matter how hard I tried to educate and set my students on a path to success, if their parents or caregivers weren’t delivering the same message at home, the work was exponentially harder. Furthermore, when our overall environment is sending conflicting, unhealthy messages, we are stressed and challenged. I do believe that one person can make a difference in a child’s life, but by partnering with parents and improving community messaging, the likelihood of raising safe, healthy, drug free kids is vastly improved. Realizing the importance of involving parents during Red Ribbon Week, the National Family Partnership, the national sponsors of the Red Ribbon Campaign, developed a contest with the goal of engaging more parents in Red Ribbon Week while benefiting both the family and the school. Through the National Red Ribbon Photo Contest, ten winners from across the United States are eligible to win an iPad for the family and $1,000 for their local K-12 school.